The topic of sleep and the lack thereof is quite the hot topic. Studies found that consistently sleeping for fewer than six hours each night may cause an early death. Ironically, too much sleep can also cause problems. New research analyzed data from 16 separate studies. People who habitually slept for less than six hours a night were 12 percent more likely to experience premature death. While people who consistently sleep more than nine hours a night can also be more likely to die early, the oversleeping may be an indicator of underlying ailments rather than a cause. Its no surprise that many people suffering from poor sleep turn to sleeping pills to get relief. Unfortunately, it now appears that reaching for a sleeping pill in order to get a good night’s sleep is pointless. The U.S. Food and Drug Administration has had data for 15 years which shows that over-the-counter sleep medications such as Tylenol PM and Excedrin PM don’t offer any significant benefit to patients. It is not unclear why the FDA took 15 years to evaluate the data. Furthermore it does not appear likely that any action will be taken against the makers of these medications regarding advertised claims which have now been proven untrue. Acupuncture, the ancient healing therapy from China has, yet again, been validated by modern research. Recent studies have found acupuncture to be effective for both acute and chronic back pain. Government statistics show that back pain rates near the top for lost worker productivity which adds up to an annual $19.8 billion dollar loss to the economy. Furthermore, research has found that Americans spend $37 billion dollars per year treating back pain. Sadly, a good portion of this is spent on pain medication that does nothing to actually resolve the problem. has such an impact on individual wallets and the productivity as a whole there has been extensive research on the use of acupuncture for treating back pain. A review of medical literature in 2008 concluded that there is “strong evidence” for the use of acupuncture for treating low back pain. A more recent study published in the May 11, 2009 issue of Archives of Internal Medicine confirms previous findings. Daniel C. Cherkin, PhD, and and fellow researchers examined a group of 638 patients suffering from back pain to determine not only if acupuncture is superior to usual care for treating back pain, but to see if needle insertion at individualized points is the mechanism of action by which acupuncture works best. 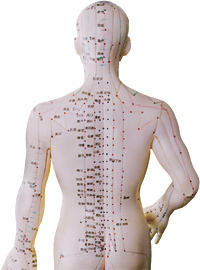 A total of 10 acupuncture treatments was provided over the course of eight weeks. Individualized acupuncture: This treatment was prescribed by the diagnostician at the beginning of each visit. There were no constraints on number of needles, depth of insertion or needle manipulation. Needles were retained for 18 minutes. Seventy-four distinct points were used. Standardized acupuncture: This protocol used a standardized acupuncture prescription considered effective for chronic low back pain, including Du 3, Bladder 23 on either side, low back Ashi point, Bladder 40 on ether side and Kidney 3 on either side. All points were needled for 20 minutes, with needle stimulation at 10 minutes and again just prior to removal. Simulated acupuncture: This technique used a toothpick in a needle guide tube. All acupuncture points were stimulated with toothpicks at 10 minutes and again at 20 minutes, just before they were “removed.” The acupuncturists simulated insertion and removal of needles at the eight acupuncture points used in the standardized treatment. Conventional care: Participants in this group only received the care, if any, they and their physicians chose. This was mainly mostly medications, and primary care, and physical therapy visits. All participants received a self-care book with information on managing flare-ups, exercises and lifestyle modifications. Not surprisingly, the study concluded that individualized acupuncture care to be the most effective treatment modality compared to standardized acupuncture - which was also fairly effective, and far more effective than sham acupuncture, and certainly better result compared to strictly conventional treatment. This study show that acupuncture can be effective for back pain, but more importantly individualized treatment is far more effective because when you treat the person you can begin the true healing process. As an acupuncturist I always provide individualized treatment based diagnostic result. I often rely on digital meridian analysis along with more traditional Chinese medicine diagnosis to completely customized the treatment to the person. For those of you in the Portland metro area who want to experience the true healing power of acupuncture, please schedule an appointment with me by calling us 503.517-8222. Complementary consultation available upon request.